This week I celebrate writing: stories that exist in tiny spaces, poetry that crops up and opinions that blaze. Today I Celebrate This Week with Ruth Ayres. Thank you, Ruth, for giving this space for writing. Our stories and thoughts are stored up in inside. This week we looked for opportunities to let them out. We started blogging on paper. Yes. That is where we start. Seeing the physical space a blog post will fill is the first step. I wanted students to see that a blog post should be more than a text message. Putting forth a fully formed idea should take up a whole sheet of paper. Thursday comments were read; blog posts were published. Here are our stories. One time stories, first time stories, in kindergarten stories, skateboard stories, Halloween stories, how I became an artist stories, the book I just read stories, texting stories, video game stories, in the park stories. Here are our opinions. Why we should be allowed to bring cell phones to school, why cats are better than dogs, why dogs are better than cats, why Mario Cart is awesome. Here are our poems, our poets. “We can write poems? !” Here is the possibility of poetry. This week our community got to know one another a little better. Some students held back and only wrote comments. But isn’t that the way for some of us. Some wait and watch. I had thought next week we’d start on the electronic blog. But now I’m reconsidering. Perhaps we need another round of paper blogging. Time to watch and try out. To stretch and consider possibilities. The physical nature of touching paper and bright post-its invites in a way that digital does not. Our stories, our opinions, our poems of the right now matter and inspire others to find their own. When we write, we go beyond the ears of the person sitting next to us. We reach out and document the way we see things right now. We take our experiences and emotions that lie in our head and heart and filter it through writing and drawing. It’s like a recycle, a rehash. The result might not be exactly as it was, not exactly how it went, or how we wanted it to go. But it is where we are right now. Writing helps us see who we were, are or maybe can be. Writing is what makes us, us. And more than what we thought we could be. 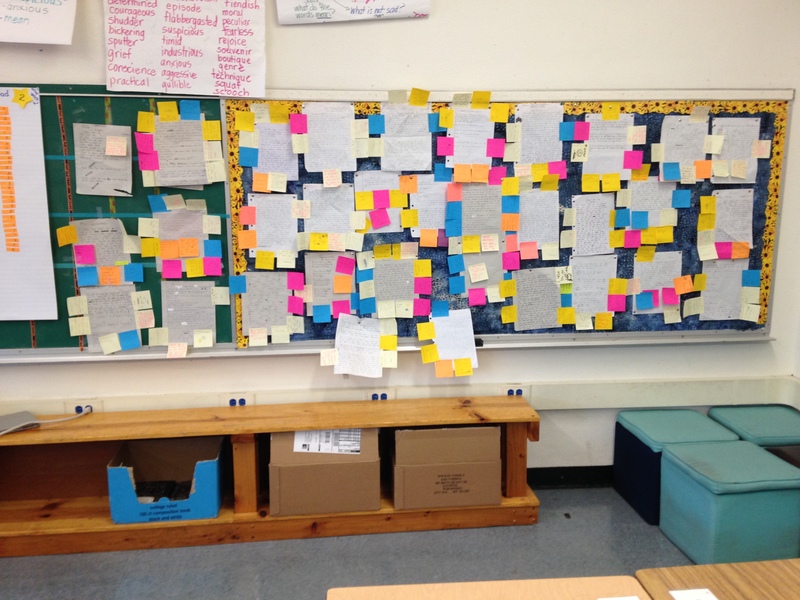 Beautiful bulletin board with paper blog posts!!! LOVE this!!! Our “paper blog posts” are coming soon!!! You always inspire me, Julieanne. Thank you!!! Love the idea of doing on paper, first, Julieanne-briliant. Now I want to go back to do again! And think this is just right: “We take our experiences and emotions that lie in our head and heart and filter it through writing and drawing. It’s like a recycle, a rehash.” So true! I always say I write to understand myself. But, you put it so much more eloquently. I just love the image and imagining all of the words, thoughts and opinions! “Writing is what makes us, us. And more than we thought we could be.” I think I’ll be quoting you to my students this week. 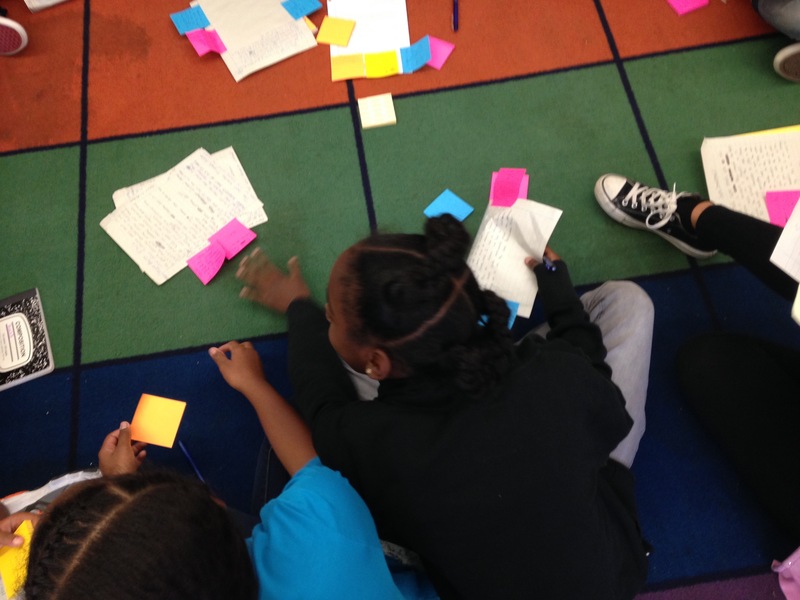 I love the image of the pieces of writing surrounded by sticky notes. You class will blossom with your careful attention. What a great way for students to share their writing and become comfortable with communicating with each other. “Writing helps us see who we were, are or maybe can be.” The paper blogging is a very good idea to visualize and feel what a blog post – the story – could be like. Julieanne, giving your students the opportunity to let their voices rise is a gift. I like the way that you are trying out different options for your students to become budding writers. If they do write poetry, might you interest them in writing for my fall gallery? I have two student poems ready for the gallery I am about to unveil: Summer Splashings. Enjoy your school year. Writing does make us more than we thought we could be! I love that line. What a great start to your writing community this year.